Our fish tank has been through a lot since our last update. We started off with 5 tiger barbs, which turned out to be too aggressive for our taste. One of them was especially mean, chasing the others around and biting at their fins. It was stressful to watch! We got the fish on a Saturday, and by the time we woke up on Sunday morning, one (the mean one) was dead and another was in its death throes. Another two passed later in the day. The last one held on for a good 2 or 3 days after that, but finally died as well. We believe the fish died as a result of changing water temperatures. We had our water tested at the fish store and came home with 3 new fish. We chose diamond tetras this time. They aren’t as flashy, but they are great fish! They are unbelievably friendly. Whenever we go look at the tank, they swim over to us. 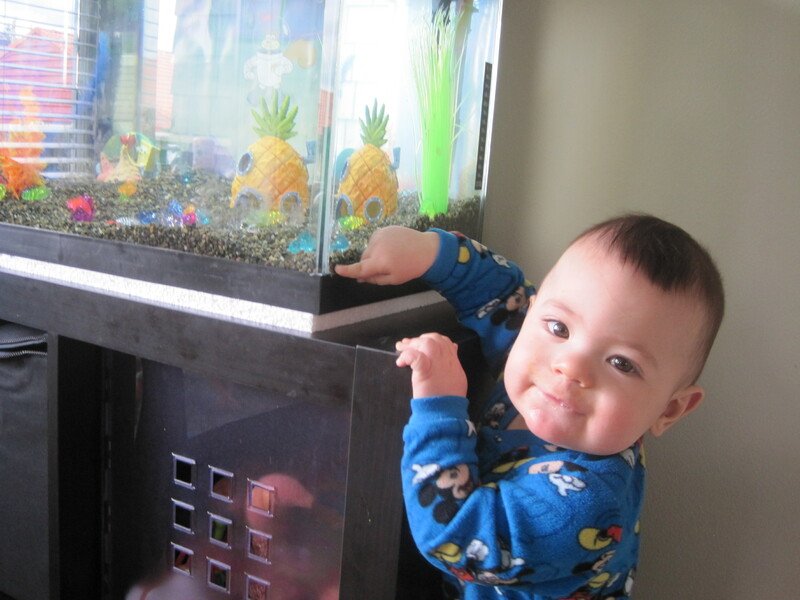 Sam LOVES this, and he’s taken to spending a lot of time looking and pointing into the fish tank. We often hear him over there saying “ffffff”, “ffffff”. It may be the beginning of a new word for him! Speaking of pointing, Sam’s doctor was very happy to see him pointing a lot at his appointment on Friday. It is a very important social milestone. Sam has been doing a lot of pointing lately. 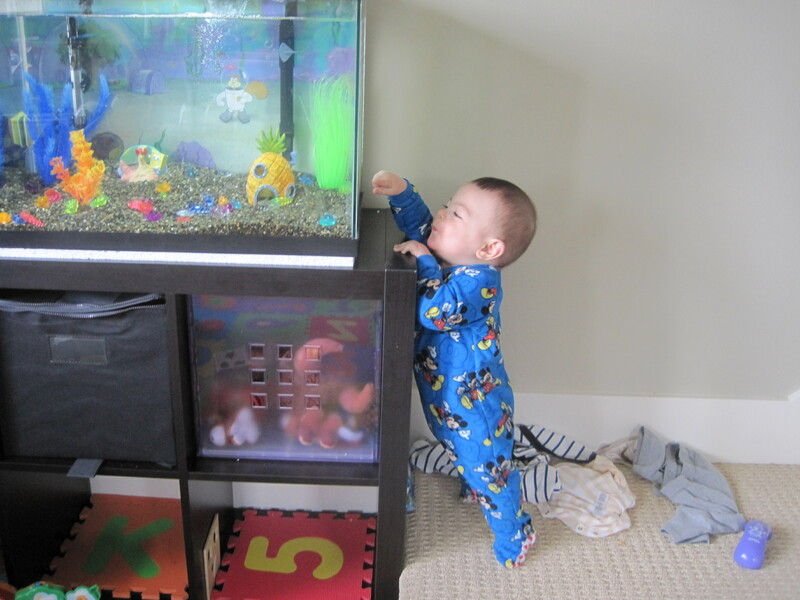 He points at the fish tank, at pictures in his many new books, and at pictures of himself on the computer. Today we took him swimming for the first time ever, and he even pointed to tell us where he wanted to go in the pool. It’s nice to see him communicating! Sam wasn’t so sure about swimming at first. There were a lot of kids there and it was loud. Sam warmed up to it after awhile, though and seemed to be kind of enjoying himself in the end. We don’t have any pictures, unfortunately, because I left the SD card in my computer at home. Next time, we’ll definitely get some pictures.